A recent article in the Canadian Cattlemen by Angela Lovell outlines Flood relief for producers in the Lake Manitoba and Lake St. Martin areas. The Manitoba & Federal Governments combined are allocating $540 million towards flood protection projects for Lake Manitoba and Lake St. Martin. Read the full story at https://www.canadiancattlemen.ca/2018/10/22/better-flood-protection-on-the-way-for-manitoba-cattle-producers/? This is the type of land many Farmers dream about owning but never accomplish. Check out the exceptional land details and soil characteristics: Topography – T1 (Level) to T2 (Gentle Slopes), with a small amount of T3 (Moderate Slopes), Soil – Predominately a mix of Canora/Kamsack Silty Clay Loam & Canora/Oxbow Clay Loam, Stone Rating – S1 (None to Few) to S2 (Slight), Final Ratings – Average of 83.2, with some as high as 97.78, SCIC Soil Ratings – 1 x C, 13 x D, 1 x E, 2 x F. Wow, that is some impressive Farm Land! This is the area the Field of Dreams competition for Canola was started in and with good reason. If you want to maximize today’s high level of crop genetics & fertilizer combined with state-of-the-art precision equipment you need the best of the best land and this is your chance! Add in the modern yard site with intact operating Pedigreed Seed & Custom Seed Cleaning Plant, 162,000 Bushels of Grain Storage, 56’ x 120’ Machine Shed, and 2128 sq. ft. Home and you are ready to go. The Vendors are well known for operating a class act Pedigreed Seed business & Custom Seed Cleaning in this high yielding, high quality Grain area. So, what are you waiting for? Pickup the phone and call to get started on your way to owning this awesome Farm! At this years Farm Progress Show in Regina the People’s Choice Farmyard Invention went to Darcy Goossen from Farintosh, AB for his Tiregrabber. 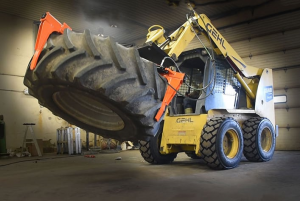 Built for a Skid Steer, suspect it could also be used on most any Front-End Loader, this 3 point hydraulic system takes the backbreaking work out of trying to man handle large tires. Check it out at http://thetiregrabber.com/ . If you or someone you know are looking for a quarter with yard site be sure to checkout the recent listing located 2 Miles East of Canora on Highway #5. This property showcases one of the cleanest and well cared for yard sites you will ever find. Located on the bank of the Whitesand River this is truly an awesome place to call home! Check out the Drone Video at https://youtu.be/Vy81-r0Q7_g . Good news for Canadian Farmers growing produce for store shelves! As posted by Chris Koger on June 28th in “The Packer”, https://www.thepacker.com/article/canadas-loblaws-pledges-buy-local?utm_source=Subscribe+to+FCC+email&utm_campaign=cb9903968d-FCC_Express_2018_07_06_EN&utm_medium=email&utm_term=0_ecca3657d7-cb9903968d-19267541 , Loblaws, the giant Canadian retailor run by CEO Galen Weston, in a June 27th news release voiced their continued support for Canadian grown fruits and vegetables. The company is pledging to spend an additional 150 Million per year by 2025 by continuing to purchase local when possible and through investment with our farmers into aid for infrastructure for greenhouses and other potential season extending possibilities. At present roughly half of the stores produce comes from a network of about 300 Canadian producers. This is good news as we have been far too reliant on our fruit and vegetable needs from out of country sources. Perhaps with new research/technology, continued support from companies like Loblaws, our various levels of Government, and of course ourselves as consumers, we will be able to make gains in helping our Canadian Produce Farmers become better positioned to supply more and more of our daily fruit and vegetable needs. With the month of July comes the annual Ag in Motion outdoor farm show located 15 minutes NW of Saskatoon along Highway 16. This show continues to grow each year with access to a full section of farm land for exhibits, crop plots, machinery exhibits and demos, and much more. Encompassing both Grain and Livestock there is something for everyone at this exceptional showcase of everything Agriculture. Hammond Realty will once again be at the show located on Lot 526, 5th Street. Come on by to say hello and discuss the latest trends in the Farm Land Selling/Buying market. Show dates are Tuesday July 17 to Thursday July 19, 2018. Since early in the year Environment Canada has been calling for a Hot & Dry Summer on the Prairies this year. While May certainly was one of the warmest on record with low rainfall, June has seen some areas receiving an abundance of rain, often as thunderstorms. Areas like Pelly and Esterhazy have seen some downpours into the 5″ range with most everywhere else seeing amounts ranging from 1/2″ and up. Yorkton this past weekend received about 2″ on the SW corner and about 6/10th’s on the East side. Typical wide ranging amounts with thunderstorms. Some producers in the Moosomin area have a total of about 14″ already this growing season and are hoping the tap turns off! While they seeded through everything this year, the sloughs are now once again full. This coming week is showing a wet week again with thunderstorm activity forecast for more days than not. While time will of course tell, if it does turn hot and dry through July and August we will be thankful for the rain we received in June! Posted on June 25, 2018 Leave a comment on Wet or Dry? Once again the month of June brings about the longest running premium Farm Show in Western Canada. The Farm Progress Show is being held June 20 to 22, 2018 in Regina, SK at EVRAZ Place. Hammond Realty is happy to be in attendance with our display setup in Booth 70133 & 70135 in the EventPlex (Hall #7). The weather forecast is excellent so be sure to come on in to Regina and stop to see us regarding everything related to Farm Land in Saskatchewan. See you at the show!!!!! The Canadian & Saskatchewan Agriculture departments just announced their new 5 Year Program called the Canadian Agriculture Partnership (CAP) which replaces the previous Growing Forward 2 Program. This is excellent news for Canadian Farmers with 388 Million slated over the coming 5 years to help in all areas of farming including new Research & Development. The program also offers many rebate programs to help with things like education and livestock development to name a few. Go to http://www.saskatchewan.ca/business/agriculture-natural-resources-and-industry/agribusiness-farmers-and-ranchershttp://www.saskatchewan.ca/business/agriculture-natural-resources-and-industry/agribusiness-farmers-and-ranchers for all the details. The Western Canadian Crop Production Show has become Western Canada’s premier grain industry showcase by presenting information to producers on the latest technology, services, and products. Ag in Motion is the largest agricultural trade show in Western Canada that provides an outdoor venue for progressive farmers that want to see and feel the latest agricultural innovations – all in one place. Join more than 40,000 attendees and 700 exhibitors from around the world. Located in Regina, Saskatchewan, Canada’s Farm Progress Show connects local producers and international customers with the latest in dryland farming equipment, technology and innovation. Do you have Farm Land to sell? Looking for top notch exposure and representation? Competitive bidding like no other forum can provide? to be held Thursday March 15, 2018 in Yorkton, SK. With the recent success of Land Auction Events in November and December of 2017 we have moved forward with planning a Multi Seller Land Auction Event to be held in Yorkton, SK on March 15, 2018. This Event is open for land consignments from Land Owners in every direction. The format we use is proving to be a new and exciting option for land owners who are looking to capitalize on top end returns for their property and the excitement of this service is certainly building momentum. The combination of Hammond Realty and Berlinic Auctions Ltd, both who specialize in Farm Land Marketing and Sales, is second to none and until now has not been available to land owners. For more information on this Event and how it may fit for your Farm Land call Wade at 306-641-4667! Deadline for land consignments for this Land Auction Event is January 24, 2018.